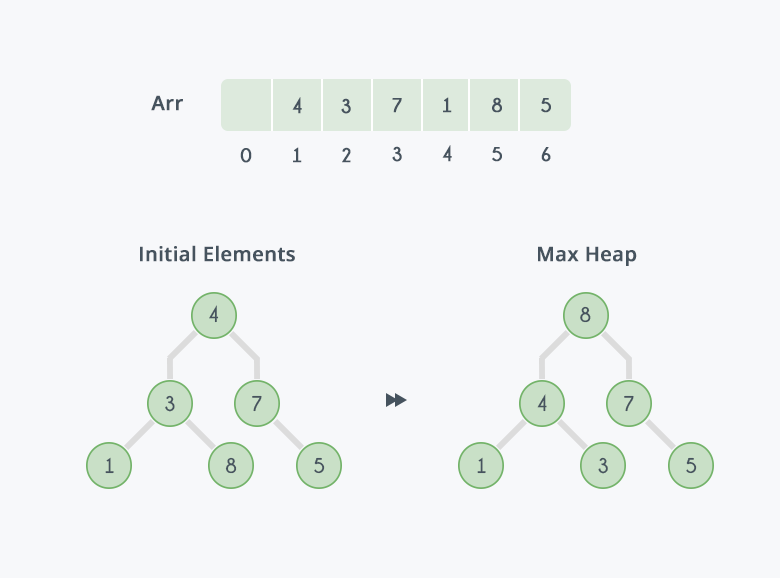 Heaps can be used in sorting an array. In max-heaps, maximum element will always be at the root. Heap Sort uses this property of heap to sort the array. Consider an array $$ Arr $$ which is to be sorted using Heap Sort. Initially build a max heap of elements in $$ Arr $$. The root element, that is $$Arr$$, will contain maximum element of $$ Arr $$. After that, swap this element with the last element of $$ Arr $$ and heapify the max heap excluding the last element which is already in its correct position and then decrease the length of heap by one. Repeat the step 2, until all the elements are in their correct position. max_heapify has complexity $$ O(logN) $$, build_maxheap has complexity $$O(N)$$ and we run max_heapify $$N-1$$ times in heap_sort function, therefore complexity of heap_sort function is $$O(NlogN)$$. In the diagram below,initially there is an unsorted array Arr having 6 elements and then max-heap will be built. Step 1: 8 is swapped with 5. Step 2: 8 is disconnected from heap as 8 is in correct position now and. Step 3: Max-heap is created and 7 is swapped with 3. Step 4: 7 is disconnected from heap. Step 5: Max heap is created and 5 is swapped with 1. Step 6: 5 is disconnected from heap. Step 7: Max heap is created and 4 is swapped with 3. Step 8: 4 is disconnected from heap. Step 9: Max heap is created and 3 is swapped with 1. Step 10: 3 is disconnected. After all the steps, we will get a sorted array.